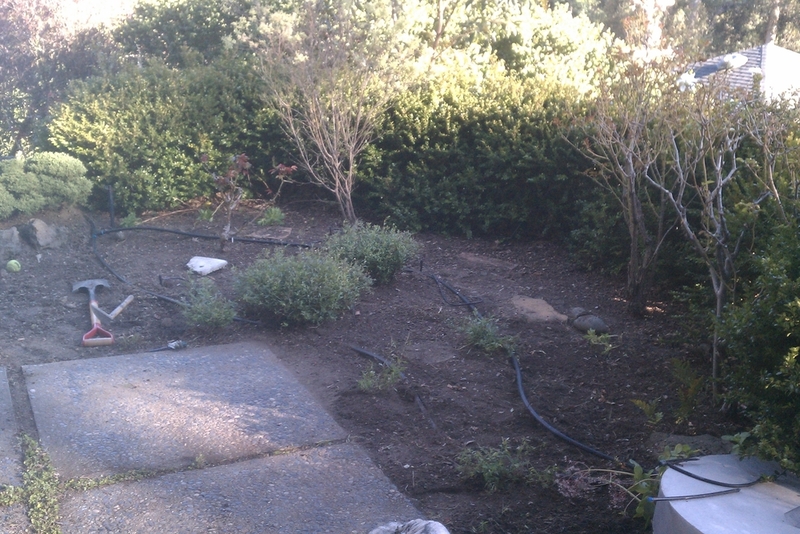 This sunny coastal front garden and shady back patio beds were wild and worn when the homeowners purchased their house. 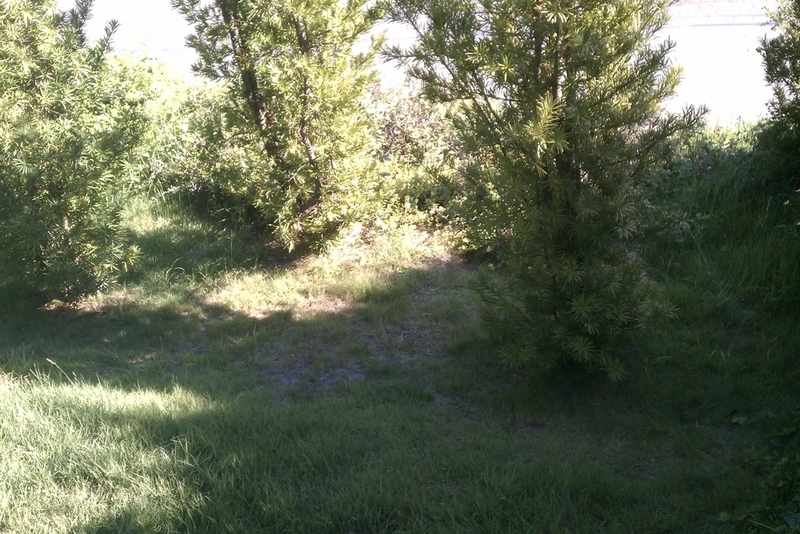 The front was matted with weedy grasses and brambles, was frequented by deer and wild turkey, and had densely clay soils. Rototilling allowed a fresh start: the chance to add organic matter to the soil and plant diverse, colorful, deer resistant and drought tolerant plants. Several raised beds also created space for the homeowners to grow their own food, so while the landscape is very low maintenance, they still visit their garden to harvest on most days. In Lafayette, this garden design eliminated an under-utilized lawn (which was boggy in winter and needed excessive watering in summer) and incorporated raised beds of variable heights, shapes and scales to add dimension to an otherwise flat expanse. 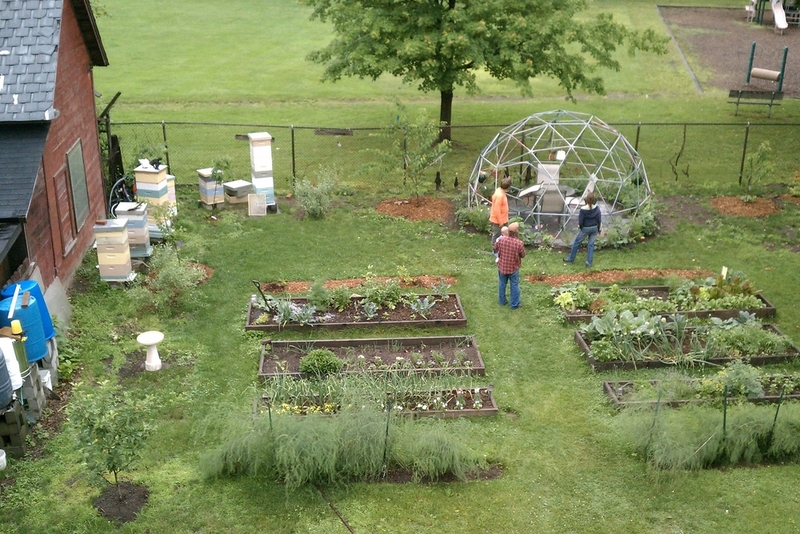 Beds are planted with an abundance of vegetables and flowers, and are bordered by fruit trees. 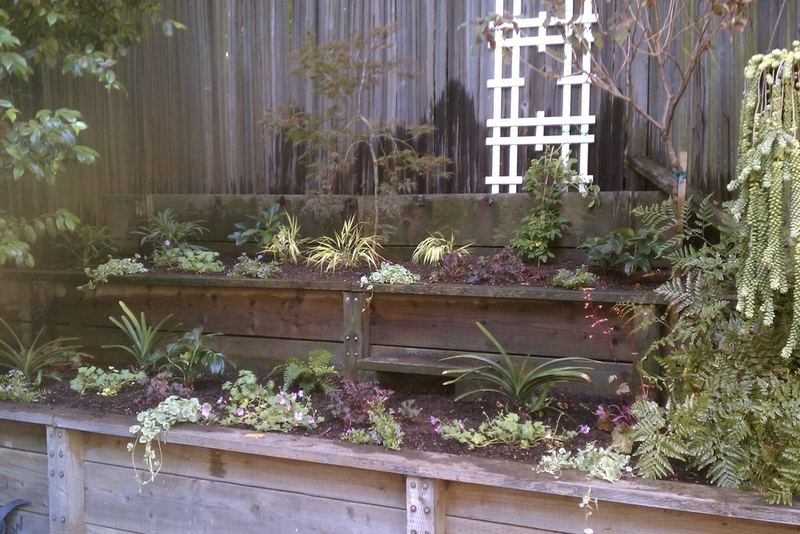 In a shady corner, struggling raised beds were replaced with a sitting area that stays cool during hot inland summer days. This little garden is a stone's throw from the bay, so is influenced by wind, fog and salt air. The homeowner wanted plants for long-lasting color and cut flowers. 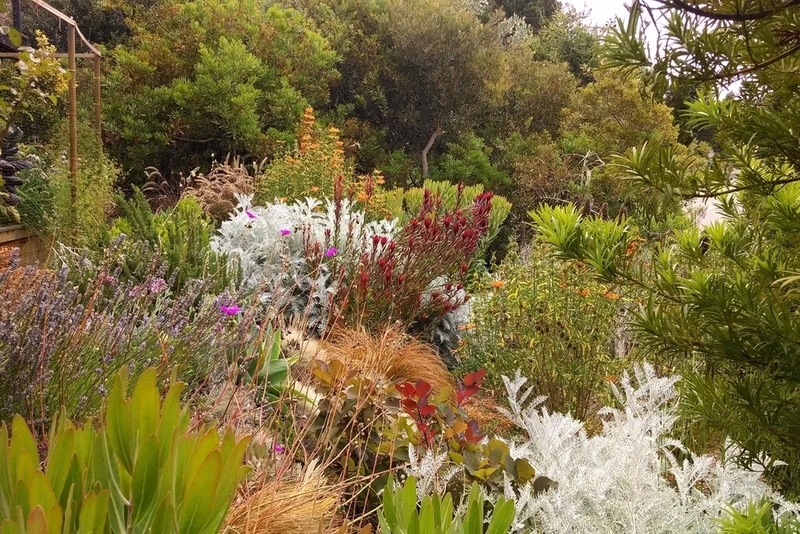 Capturing the colors of the sun setting across the bay, a mix of yellow, orange and pink flowering perennials, along with sedums, succulents, California natives and grasses are bright, easy and require low water and minimal maintenance. These D-I-Y homeowners wanted their garden to be a model homestead in their community. By removing diseased trees, they gained lots of sunshine for growing food, and opened the fenceline to an abutting park, which welcomes interested neighbors to see the vegetable garden, fruit trees, bee hives and rainwater catchment system. 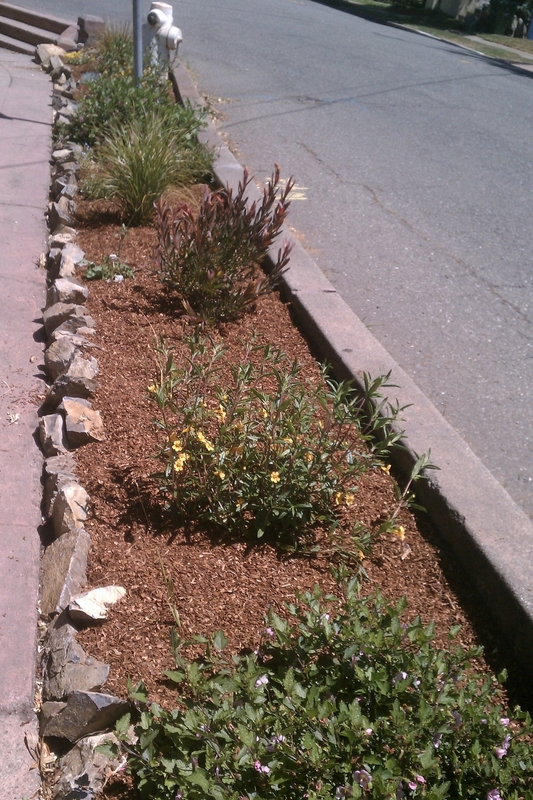 The design for two long sidewalk strips had to address several challenges: heavy pedestrian and dog traffic, deer browsing, minimal irrigation and narrow beds. Plants used are a mix of California native and Mediterranean species that are proven drought tolerant and low maintenance, deer resistant, and hardy to withstand the occasional footfall.